I haven’t had Salisbury Steak since the 70’s! 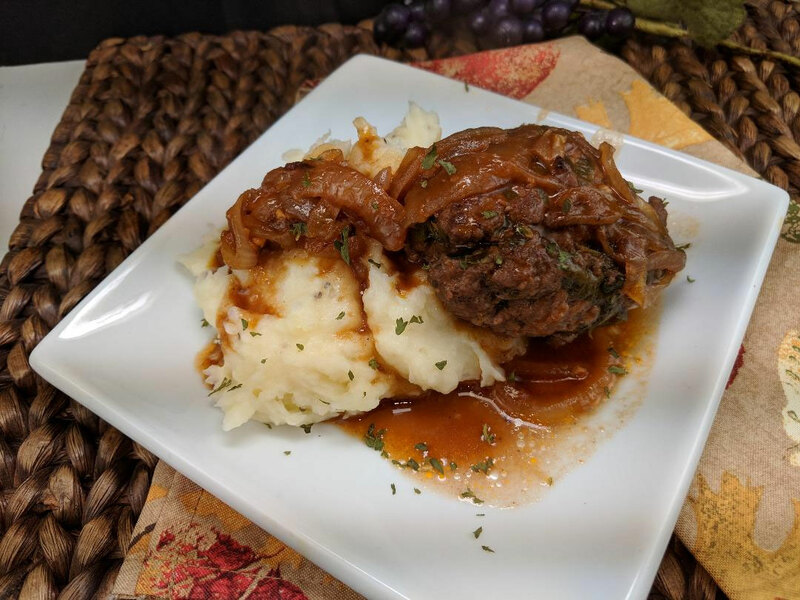 When I noticed this French Onion Salisbury Steak in a Cuisine At Home magazine, I had to make it! 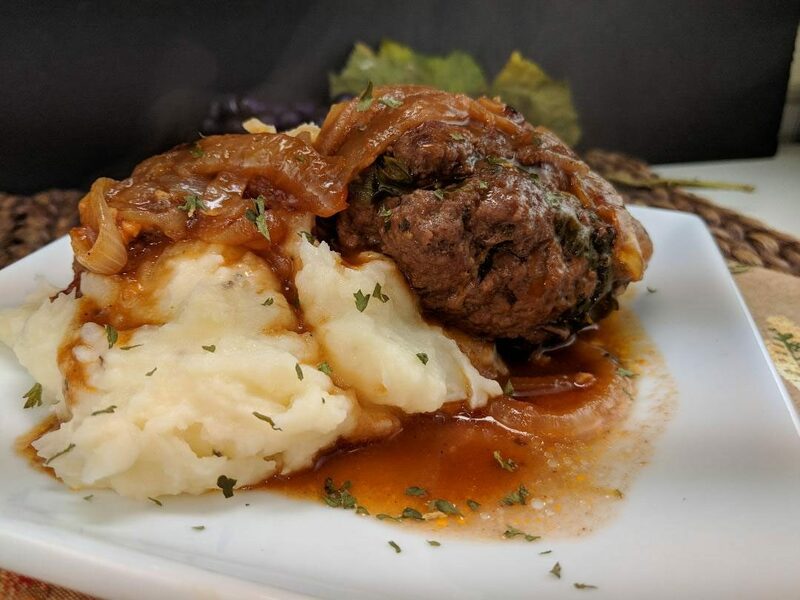 This Salisbury Steak sits in a great mixture almost like French Onion Soup. The broth or gravy, is INSANELY delicious! I use Cabernet Sauvignon specifically Beringer Founders Estate red wine. I like to use a deep dark full bodied wine when making beef stews or soups. The recipe calls for the Salisbury steak to sit atop a piece of cheese toast with the onion mixture ladled over top, which I don’t usually bother with, as I am always short on time, although it does sound fantastic. I usually make creamy mashed potatoes and lean the Salisbury Steak on the potatoes. Them I drench both with the super tasty onion gravy. 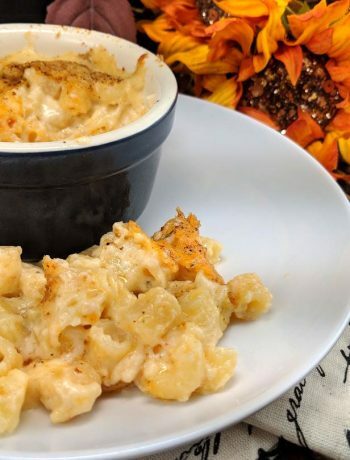 I have made this recipe many, many times, It is that good. If you love caramelized onions and hamburger, or French Onion Soup, this dish is for you! Its super easy for even the beginner cook. You just brown the Salisbury Steak. Then caramelize the onions, add garlic, tomato paste and flour. Then add wine and beef broth. 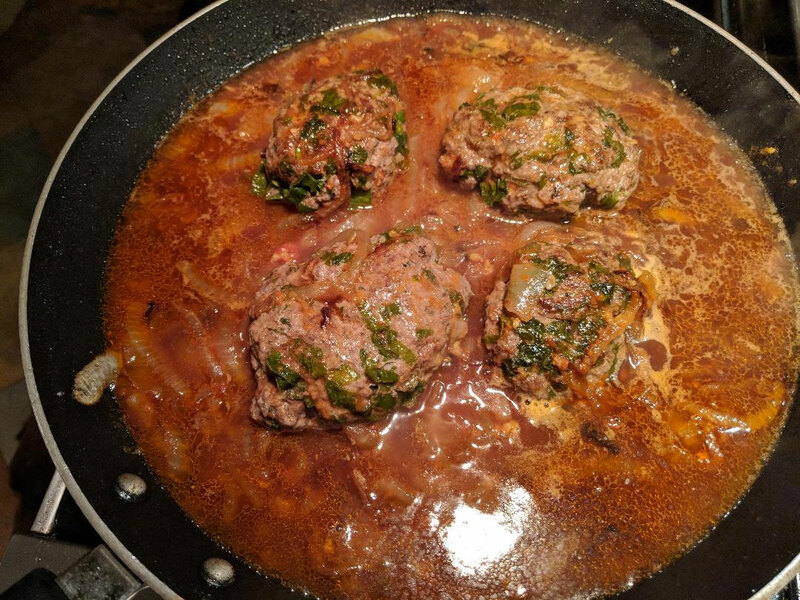 Put Salisbury Steak back into the broth and cook for about 10 minutes. I told you it was easy! 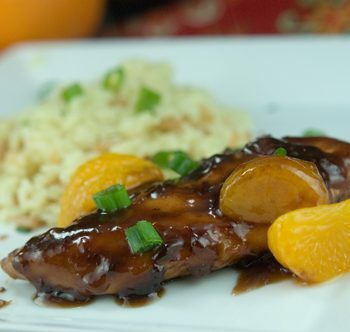 And you are not going to believe how yummy this dish is! I literally could lick the plate! Combine ground beef, pork & veal, parsley, scallion, salt & pepper. Divide evenly into 4 portions, and shape each into 3/4" to 1" thick oval patties. Place 2 Tbsp flour in a shallow dish; dredge each patty in flour. Reserve 1 Tsp flour (or 1 Tbsp if you would like broth thicker). Heat 1 Tbsp oil in a saute pan over medium high heat. Add patties and saute 3 minutes on each side, or until browned. Remove from pan. Add onions and sugar to pan; saute 5 minutes. Stir in garlic and tomato paste; saute 1 minute, or until paste begins to brown. Sprinkle onion mixture with reserved (1 tsp or 1 Tbsp) flour; cook 1 minute. Stir in broth and wine; then add the salt and thyme. Return meat to pan and bring soup to a boil. Reduce heat to medium low, cover, and simmer 10 minutes. Serve patties on cheese toasts, with onion soup ladled over. Garnish with parsley and Parmesan. Preheat oven to 400° F. Place bread on a baking sheet. Combine butter, garlic and paprika, and spread on one side of each slice of bread. Combine cheeses, and sprinkle evenly over butter. Bake until bread is crisp and cheese is bubbly, 10-15 minutes. I use the tomato paste in a tube (like toothpaste). It's great for recipes like this that call for small amounts of tomato paste.